Helping humans reconnect with their humanity. 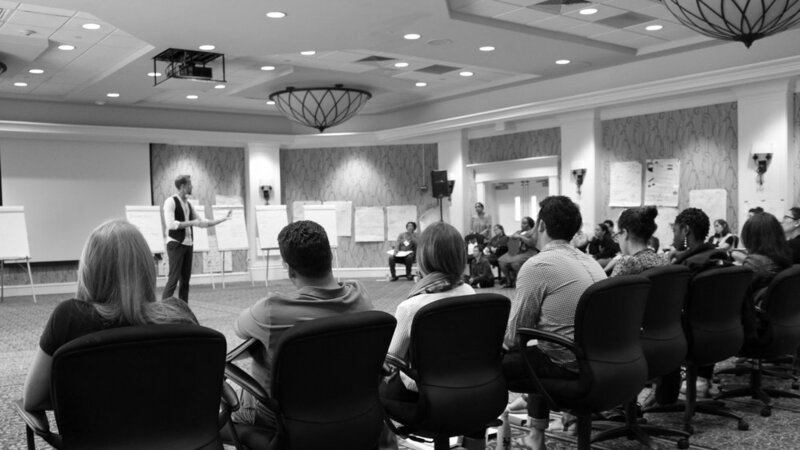 RESET is a mindfulness and creativity program designed to help people and teams reconnect to their values and build cultures of belonging where innovation can thrive. Organizational environments have been built on efficiency, and all to often the first thing that falls to the side is our humanity. The things that make us unique—our stories, our gifts, the adversities we’ve overcome—are what make us most valuable. Through a tailored approach, we combine expert facilitation in the fields of: mindfulness (focus and compassion based meditation), creative writing (poetry and narrative design), and community building (storytelling, games, and adventures). What inevitably results is deeper self-awareness and bonds with our teams that lead to meaningful relationships and thriving work environments. In a world competing for views and loyalty, we believe our attention, combined with our intentions and the behaviors that follow, are our most valuable resources. Through mindfulness and meditation we strengthen these capacities and work to realize tangible benefits in our health, relationships, careers, and organizations. Each of us is unique. The ways we express our uniqueness make us invaluable pieces in the fabric of our societies and organizations. By sharing our stories our gifts become clear and our passion to share them in service of others continues to grow. Like a great symphony, we must hone our instruments together, on the stage, in order to fully understand our weaknesses and enhance our strengths. We believe in leaving the world better than we found it and that that requires us to grow as individuals together. Reset the reflex to react. When the default is the fault, take a step back. Sometimes the way home takes a new map. RESET was founded in the fall of 2018 by Kurt Peloquin a former Private Banker turned award winning ad agency producer, poet, certified meditation instructor and teaching artist. To date, we have designed and facilitated year long poetry and meditation programming at The Jill Chaifetz Transfer School (Bronx, New York) in partnership with the international youth empowerment group Breaking Walls, a week long creative writing and mindfulness retreat for veterans with Warriors at Ease, a creative writing workshop with The Reimagine End of Life Festival in New York City, and co-host Just Wundering a monthly storytelling series at WPP ad agency Wunderman Thompson.